At irregular intervals RTW presents videos including reports, teaser, user stories, product presentations, partner statements, and others. Also you may find external reports about RTW or showing sequences with RTW units in operation. These videos also may be found on our own video channel called RTWCologne at YouTube. 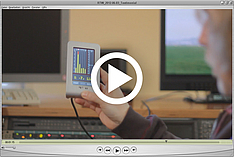 Martin Haas, Musican, Composer and Producer talks about the new RTW Mastering Tools plug-in. He is the producer of Xavier Naidoo, Cassandra Steen, Glashaus, Moses Pelham and many more. The team of tv-bay's KITPLUS visited again RTW's booth at this year's IBC Show talking to Mike Kahsnitz about RTW Mastering Tools and TM3-Primus. The video is posted on KITPLUS' YouTube channel. Thomas Lund of TC electronic® reports at NAB 2012 about P/Loud and the cooperation with RTW. Anthony Wilkins, RTW's International Sales Manager, introduces TouchMonitor TM3. Managing director Andreas Tweitmann about the RTW brand and impressions from the presentation at the NAB Show 2012 in Las Vegas.